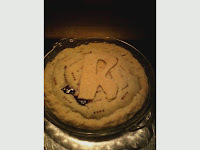 Since this blog has the word "cooking" in the title, I figured I'd put a recipe or two in here. These are a couple of soup recipes I made up recently that were big hits at our weekly RuPaul's Drag Race Monday night soup gatherings. mix cabbage, peppers and onions together in a bowl. whisk lime juice, sugar, salt, garlic and jalapeno in a cup and pour over vegetables. toss to coat. Melt margarine in heavy bottom stock pot on medium. Stir in ginger, curry powder, pepper flakes and cloves to make a paste. Toast for a few seconds, then add onions and stir to coat. Cook onions till soft, about 5 minutes. Add chopped tomatoes and set on low flame to cook down, about 20 minutes. If mixture seems to get dry, add a little water. Stir occaisionally. When tomatoes are broken down, take off flame and mix in coconut milk and salt. Puree with stick blender till smooth. Stir in salt and brown sugar. Taste to correct seasonings (may need a bunch more brown sugar depending on how sour your green tomatoes are, and salt is a matter of personal taste) Enjoy with friends! St Patrick's Day as a drinking holiday doesn't mean anything to me. In fact, back in the day when I used to go to bars on the reg, it filled me with white hot rage to have to jostle for position amongst the amateurs. I actually do possess some Irish blood, and I enjoy a Guinness just as much as (if not more than!) the next lassie. But you'll never find me wearing a stupid green felt hat and carrying a giant plastic container of dyed Budweiser around. I promise you that. Since I gave up the rock n roll life for the farm, March 17th has a different and, to me, much more exciting meaning. It's the day when I actually put the first things into the garden soil. Most years, it's just barely thawed, probably 40 degrees, overcast, sorta gloomy work. I do it on that day because you have to start somewhere and if I waited for the best day every year nothing would get done, lemme tell ya. This year, however, March 17th fell not only on a super convenient Saturday with both myself and Rebby at home, but also on a day that hovered around 80 degrees all afternoon. Shorts, tank tops and sunscreen weather. Actually almost brutal for the hard work of turning over the soil for the first time. I find this unseasonable weather extremely spooky, and although I can enjoy extra sun in the moment, I am mostly concerned about what this means for the rest of the season. And, for the planet. I can't help worrying that there is going to be some freak May snowstorm and all the tender little seedlings I'll have out by then will get frozen to death. Sigh. Not much we can do besides load up on hay and hope for the best. Enough with the doom'n'gloom. Despite the trepidation, I am really excited about what we got accomplished yesterday, and what we have underway for the season. To start with, we are now up to 8 long raised beds and three small square ones, plus a few extra planting areas. Rebby built the last few beds out of old pallets she rescued from work, and they are extra deep (like 3 feet) to accommodate root vegetables. I didn't get any of those planted yet, but one of the deep ones is going to hold carrots and beets sometime this week. which is very handy when cutting down weeds that you don't want to go into your garden soil. We'll compost weeds and branches and grass clippings there to use as yard mulch. The other wood related projects Rebby worked on were the bean teepee(s) and the hugelkultur foundation. 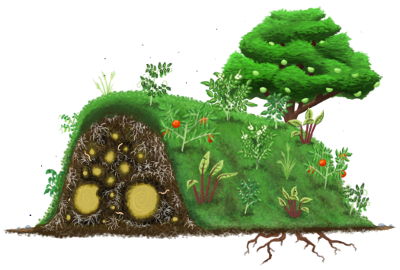 I am really excited to try out some new things this year--mostly working toward the permaculture and food forest ideas we've been learning about at the gardening workshops we've attended over the past few years. The bean teepee is going to be a trellis (or trellis-es, depending on how many branches we end up with!) made of branches pruned off our rose of Sharon and some other pieces of wood we picked up at Construction Junction for $4. It won't be bean plantin time for a while yet, but I am super excited for it! Anyway, I am going to build a Hugelbed (I think I made that up) for my squash plants this year. Rebby started busting up a bunch of wood we've had sitting in a pile for three years today, and I'm looking forward to letting it get rained on and then covering it with some compost and dirt. This is all very exciting! So while Rebby was sawing and chopping, I was digging and planting. I dug up the cover crop of winter rye we had planted on two of the non-raised-bed areas (where potatoes were last year) and chopped it all under to plant onions. I gotta say, I am a total convert to cover cropping. It was so easy to work the dirt with those nice root systems in there to keep it from clumping! I am using onion PLANTS this year for the first time, from Pinetree. Walla Walla, First Edition, Red Zeplin, and Superstar. I put most of them in the two beds at the end of the box rows, and the rest I am scattering in the middle of the wide boxes. I figure if they are in the center where it's difficult for me to get at them I will be less likely to pull them early for scallions. Sometimes I have to outwit myself. After the onions, I got in to big box from which I've been pulling winter carrots, beets, and turnips since October. The turnips and beets were done, but I still have a few carrots in there so I planted some peas around them. I also planted some radishes(French Breakfast, Cherry Belle, and Easter Egg) under the other three pea varieties, figuring that they will be done by the time the pea vines get full enough to shade them out. Pea wise I've got Green Arrow (my favorite shelling pea), Super Sugar Snap, a German snow pea variety with realy pretty flowers, and some Blue Podded Shelling Peas I had left over from last year (they aren't that tasty but the pods are very attractive and I might just let them dry this year) I built pea teepees with six thin bamboo stakes each, and planted three vines at the base of each leg. So, 18 of each vine. Woo! If it works this will be a much better use of space than the long row down the center of the bed method I've used in the past. I'll let you know. In between the pea/radish combos, I planted some lettuces: Sweet Valentine Romaine, Rossimo heading, and Pirat Butterhead. I've still got some of the Pirat going from the fall---it's a delicious and really pretty variety. The other two are new ones for this year. This morning before it started to rain I got in some Crisp Mint Romaine (my fave!) and some Viroflav Spinach to the big center bed which I am going to fill with salad greens this year. It's still got the Pirat from fall, a fall salad mix that seems to be mostly mustard (though I saw at least a few leaves of Deer's tongue lettuce this morning! )some spinach that never really got going in the fall but is coming in nicely now, and a big bunch of giant peppery arugula. There are also a couple of giant mystery brassicas that never did anything (I thought they were broccoli but they never formed heads) and a weirdly random blackberry cane stuck in the middle. We are assume it was a bird poop accident---we'll let it go a little while longer and then see if we can transplant it to a more appropriate area. I recently read an article about the euphoria inducing elements present in garden soil---I don't know if it's chemistry or just the feeling of accomplishment, but I honestly haven't felt this good in weeks. Welcome back, garden! I love you. and an even longer time since I blogged. But I actually started the 2012 garden today and for today at least, I feel compelled to keep track of it. I'm not making any promises to you or myself that I'll keep up with it, but for now here it is. This week my tax refund came in, and not a minute too soon (before the direct deposit hit I was staring at $36.00 in my checking account) I did a literal dance of joy, because the arrival of the tax refund means I can finally send off the seed orders I had agonized over about a month ago. I started out with flights of fancy and whittled it down to the bare necessities (and a few flights of fancy...I mean, I can't NOT grow the Indigo Rose tomato!!!!) My stockpile of seed, including quite a few saved seeds from the previous harvest, was pretty substantial. I tried harder than usual to be realistic about what I could actually FIT, and what we would actually EAT. Now that I am committed to pickling and fermenting, I have expanded the cucumber, carrot, cabbage, radish and turnip populations. Now that rebby and I are both madly in love with kale chips, I am dedicating a whole raised bed to three or four varieties of kale. And now that I know I can grow decent garlic, a bed is dedicated to garlics too. I've got onion plants coming from Pinetree this year---I've grown from sets previously so I'm excited to see what happens with the plants. I started a few varieties too---which I'll interplant with some other things for integrated pest management. And then there's the leeks....I was so thrilled by my leek luck this past season that I have gone totally overboard with the leek love. Since most varieties need a long growing season, they will be tucked here and there amongst other plants as well. One thing I've learned is how to maximize space in my little plot. So, today I started cabbages, leeks, onions, kales, and collards. The work of putting my seedling shelves back together and assembling the starter mat and grow lights and filling the slots with coconut grow pellets and watering them and watching them explode....it made me so very happy. Growing food really seems to be my calling. I love it. In addition to getting the seedling nursery up and running today, I started on the major project of cleaning and organizing my office room. I don't even want to try to describe the state of things in there now but I got two bookshelves for $25 each from Construction Junction and started putting things on them and already I feel so much better about the world. Give me a month. The best time to take pictures in the garden is right after a good rain. staking the tomato jungle has helped the okra take off! this is troubling...a baby melon growing through the fence! here's all three bundles of onions drying under the patio umbrella! my blue field corn is getting super tall! amaranth from the top. so pretty! Today was a very exciting day in the garden---our first tomatoes! The two little tomatoes were twins on the same plant, and I have no clue what kind they are. However, they are extremely sweet and ever so TOMATO-Y. I know most of you have eaten a tomato right out of the garden before so you understand the quality of TOMATONESS that is really only possible with straight from the warm sun tomatoes. This afternoon we also went and got some big burly stakes because the volunteer tomato army has taken over the world. My poor okra and basil were getting choked out and tomatoes were actually joining together across the garden path. Madness. At the end of last year I promised myself that I would space the tomatoes out better this year, but obviously I broke that promise. After some serious stake work by rebby things are looking a lot more tidy. 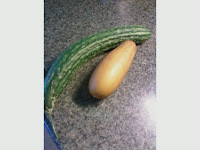 the first two cucumbers I have ever harvested from my own garden! The long green one is an Orient Express and the orange one is a Red Hmong. The Red Hmong vine is extremely prolific---there are at least ten more of those guys in various stages of ripeness on the vine right now. The Orient Express, not so much. I hope I get at least one more. The Poona Khera don't seem to be doing much, sorry to say. Bummed. So, what goes through my mind when I harvest cucumber and tomato? And then look out the back door and see a big beautiful stand of parsley next to some wild and out of control mint? That's right, it's tabouli time. Garden in your mouth. I didn't have any bulgur so I used couscous and that plus the lemon, olive oil, salt and pepper were the only things in the tabouli that did not come directly from the dirt outside my back door. Yes! I threw one of those watermelon radishes in there too, just for some interesting color and peppery bite. The last of the green garlic I pulled up a month or so ago (thanks to the largess of the Italians who used to own the place) and a small onion bulb went in too. It is the best tabouli ever, because I grew it. You may remember that I planted a bunch of yukon gold seed potatoes in early spring into trenches because I had read that they don't really respond to hilling and so it would be a waste of a good tire stack to put them in there. So, I planted four rows of seed potatoes alternating with yellow onion sets. Around mid June, the potato plants were looking so spindly and I had a big pile of dirt so I thought--it couldn't hurt to pile some more dirt on, right? So I did. Turns out that yukon golds really do only produce under the soil level of the roots, so to get to the potatoes just now I had to dig through all that dirt. Stupid. Also, the yield on the yukon golds was ridiculous---we ended up digging up the rest of the patch tonight and I'm gonna say it was an average of one good sized potato for each plant. I know that I might have gotten more if I had left them a bit longer but there comes a time in the garden (and that time is now) when you can't waste space on under producers. The few yukon golds that we have eaten from the garden have been the most heavenly potatoes EVER. So creamy and buttery yellow and bursting with flavor. So, despite the disappointing yield and sprawling habit, I will probably grow them again next year. Unless one of the other varieties turns out to be more prolific and just as tasty. I have learned some very important things this year in the garden. I am starting to figure out how to be a better grower of root vegetables. 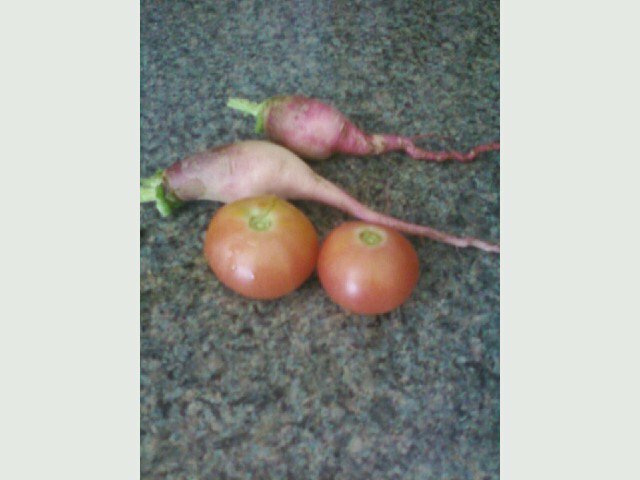 I now know that dragon purple carrots and bulls blood beets are the best for me. This is all part of the learning process. Life is good around the ole homestead! The corn is starting to form ears and the beans are all up and the okra is leafing out and the artichokes are getting tall and I am pretty sure I will have the day off to plant squash and broccoli and cabbage and brussels sprouts on Tuesday. I will also need to spend part of the day processing because my fridge is full of kale again and I am going to need to harvest some MORE to keep the peppers from being shaded out. Over abundance is a nice problem to have. I don't think I am that punk rock, but it's good to know. Now, on to the dilemma of where to put my bat house. It has to be fourteen feet off the ground. I obviously want it near the garden (for pollination and mosquito control) but I don't want it to be too noticeable because our neighbors already think we're weird--don't want to have to explain why I am inviting bats to my homestead. Yes, I should relish the opportunity to demystify bats. But I have to admit I don't really relish it. I don't know what those pieces of wood are actually about but they seem to be the exact dimensions of the bat house and dang it, there goes that magical garden luck again. I'll report back when the bat house has arrived. I did not innoculate any of my beans so I am hoping for the best. Next year I am determined to get innoculant--in fact, I may just go ahead and order it with my winter seed order to make sure I have it on hand. More sun for the basils and okra. More room for the BROCCOLI and CAULIFLOWER OMG. I am going to try direct seeding them. I don't have super high hopes but we'll see. The garden this year has been all about incredible luck so maybe it will work out with the brassicas too. Clearly, not all of them are going to be black cherry. Some of them definitely are, but I can see three distinct shapes to the baby tomatoes we have going so far. I am thrilled. These are some kind of fruits growing on my POTATO (specifically Yukon Gold) plants. I will immediately google this to figure out what is going on, but I was kind of shocked to see them today. What could it mean? Besides this mystery, things in potato and onion world are looking hella good. I think it is going to be time to harvest the first potatoes REALLY soon. I cannot wait. I trashpicked this ladder a long time ago, thinking I would use it for something in the garden. Originally it was going to be for the peas, but then we forgot. Then it was going to be for the beans, but then it turned out that I got more bush varieties than climbing varieties, so I didn't need it. But how about this: I could plant the two ends firmly in the ground, tie it together at the top (in a triangle formation) and then DRAPE this enormous squash vine over it! All the squashes could rest on the ladder rungs. Dude would be up off the ground, giving me actual planting space back! I am so excited and proud of myself for having this idea, but there is no way I am going to try to execute it now in the 80 and climbing heat. But the idea is there, and I think it will work. Huzzah. The cucumber vines are starting to climb!